El Director General Roberto Azevêdo, que participa en una serie de debates con ministros en el marco del Foro Económico Mundial que se celebra en Davos esta semana, examinó los retos y las oportunidades a las que se enfrenta actualmente el comercio mundial y destacó que el sistema de comercio debe evolucionar a fin de conservar su pertinencia. 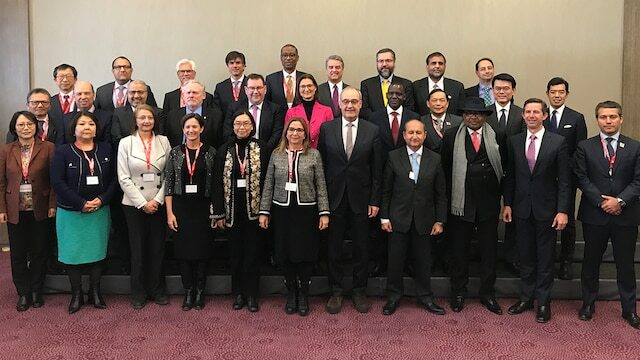 The meetings included the informal ministerial gathering on WTO issues hosted by the Swiss government on 25 January. This discussion largely focused on possible reforms to the trading system, with a range of different perspectives being aired. The need to address the impasse in appointments to the WTO’s Appellate Body was a common theme, along with the need to make progress in a number of other areas. “First, by working urgently to ease tensions. We’re facilitating conversations between members, complementing bilateral efforts. And we’re helping members to resolve their disputes. Second, we are working to modernise and strengthen the global trading architecture to ensure that it can support a changing global economy. These are the key elements that we have been discussing here this week.